Ark of Grace Ch. 8, Was Mary Rebuked by Jesus? You are at:Home»Learn & Live the Faith»Catechesis»Ark of Grace Ch. 8, Was Mary Rebuked by Jesus? During the wedding the family runs out of wine. This is embarrassing for them. Somehow Mary learns about the problem and approaches Jesus, letting him know that there is no more wine for the feast. Jesus responds to his mother with the words: “O woman, what have you to do with me? My hour has not yet come.” The same phrase is translated as follows: “Jesus said to her, ‘How does that concern us, dear lady? My time hasn’t come yet. '” (ISV) The term ???? (gunai) is by no means disrespectful. On the contrary, it is equivalent to the term “lady” in modern English. The expression “What do I have to do with you is also used in other parts of the Bible. In Kings 17, 18 the widow of Zarephath uses the same expression to request the prophet Elijah to cure her son: “So she said to Elijah, “What do I have to do with you, O man of God?” Obviously the poor widow was not being disrespectful with the prophet who had shown so clearly to be a man of God. Here the Greek word ???????? (menounye) is translated as “rather.” This affirmative Greek word literally means “additionally” or “even further.” Jesus here is agreeing with the woman who blessed Mary. He also explains that those who hear the word of God and keep it can share the same blessings by following Mary’s perfect example (see Luke 1, 48). For those present, this phrase of Jesus could never be interpreted as a rebuke of Mary. Here Jesus had just finished relating the parable of the sower (Luke 8, 5-15). In that context Jesus is teaching his audience that they have to be like Mary. Like the “fruitful soil” of the parable, she is bearing good fruit by obeying God in a perfect way. Jesus points that woman who praise him in the right direction: the blessings of God do not come merely by being part of the chosen people—while that is a good blessing—greater blessing come from humble obedience to God. 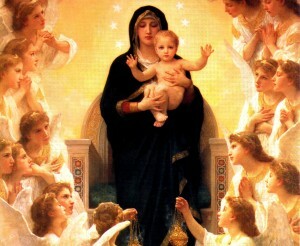 Mary is the perfect example of a human being submitting to God’s will. Again, Jesus is not rebuking or disrespecting his mother: he is exalting her and her mission. Exodus 20, 12 —“Honor your father and your mother, that your days may be long in the land which the LORD your God gives you. Deuteronomy 5, 16 —Honor your father and your mother, as the LORD your God commanded you; that your days may be prolonged, and that it may go well with you, in the land which the LORD your God gives you.